For my first day back from Japan I decided to go out and shoot some L.A. photography. And I wanted to keep the momentum going before I have to go back to work. 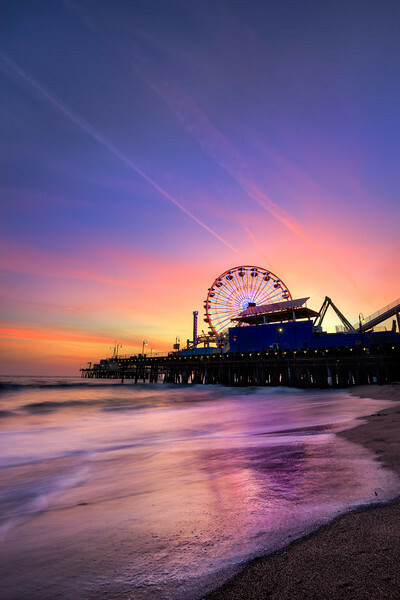 I haven't shot the Santa Monica Pier in a few years so I figured I would start there. I want to say there is some sort of magic to landscape photography, or a connection with nature with this magnitude of energy and serenity that flows threw you like many landscape photographer love professing. But the truth is, for a shot like this, you're getting wet, your lens is constantly getting spit on by the ocean. In other locations there are mesquites, it's freezing cold, or super hot. It's a constant battle. For this shot, not only do you have to time the sunset right, you also have to get the water right. By the end of my 45 minutes of shooting I ended up with something like 400 shots in sets of three, because I shot bracketed. There were maybe three shots worth using out of it. It really is a crap shoot shooting the beach like this. A game of luck being in the perfect place at the perfect time. This shot was a three shot HDR. Chosen out of a set of about 120 or so. I started shooting a bit earlier than I should have, not knowing what the light was going to do. After I got this shot I knew I had one I liked and only shot for a few more minutes since is wasn't going to get much better. To process I started with Photomatix with the strength at 0. Then brought it into photoshop and replaced the water with one of the originals. Then just color tweaks with Nik's Collection and some burning and dodging in Lightroom with some luminosity masks. I tweaked probably a little more than I needed on different layers to which is why you see so many. I did some final tweaks in Lightroom. Little more clarity and sat / vibrance adjustments. Not much. The Shot – "First Day Back"